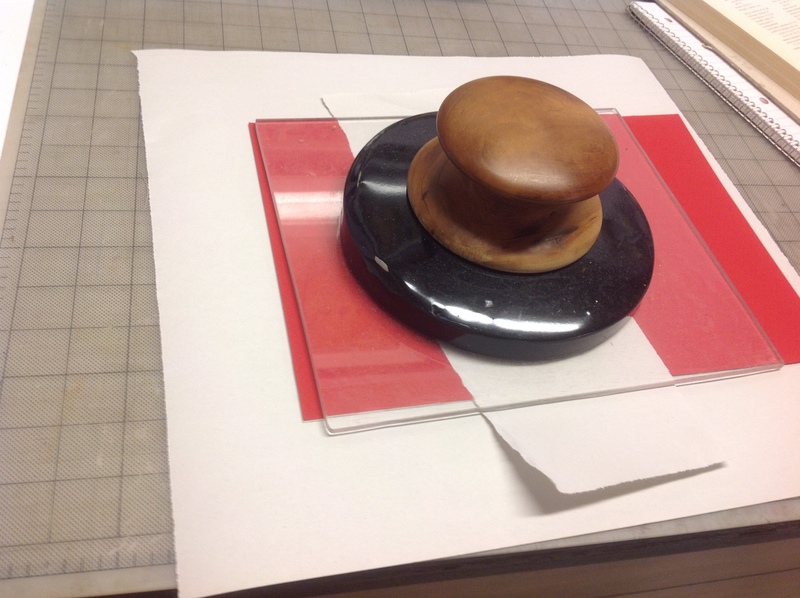 Today I finished the cover and cased-in the text block. It’s not a true millimeter binding because there is more than one millimeter of leather showing on the sides. 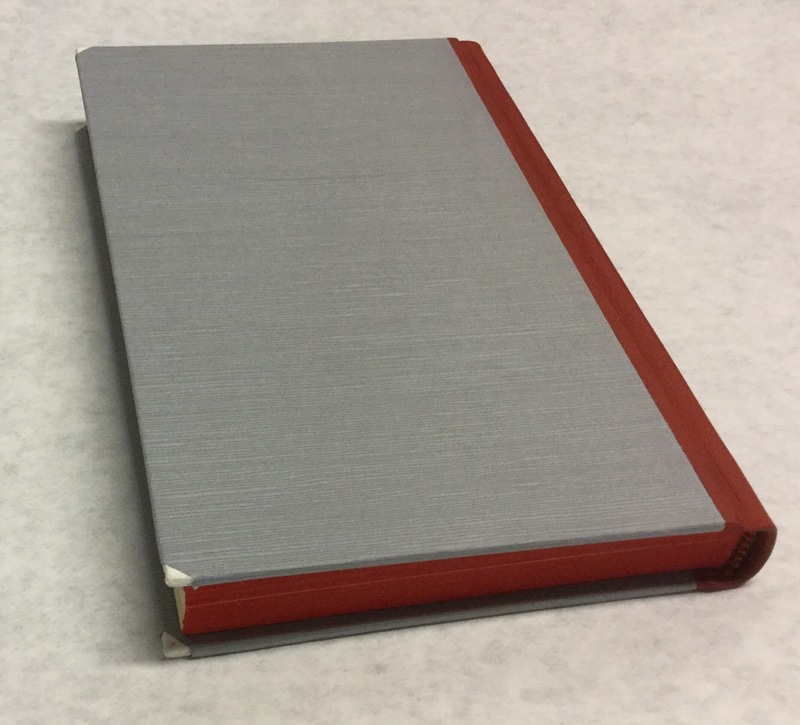 The spine is red leather, the main parts of the boards are covered in grey textured paper, and the corners are trimmed to expose the hidden vellum tips. These are small pieces of tough vellum and they stand up to wear better than paper or cloth. I used a silver foil for the title in keeping with the gray and red color scheme. 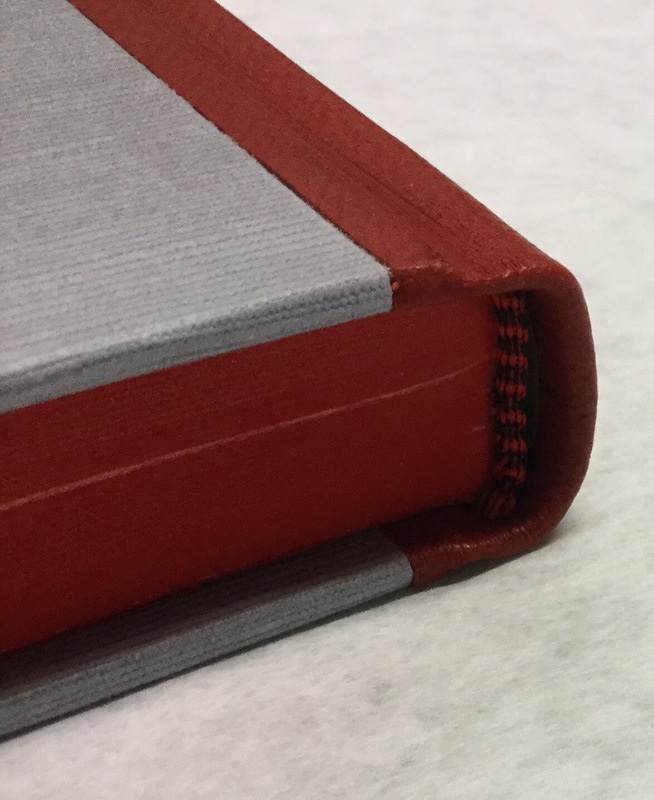 This is the first time I’ve done this style of binding, and I did wind up with an imperfection – the inside pastedowns are wrinkled near the spine, possibly the fabric lining absorbed some moisture? Ah, live and learn. 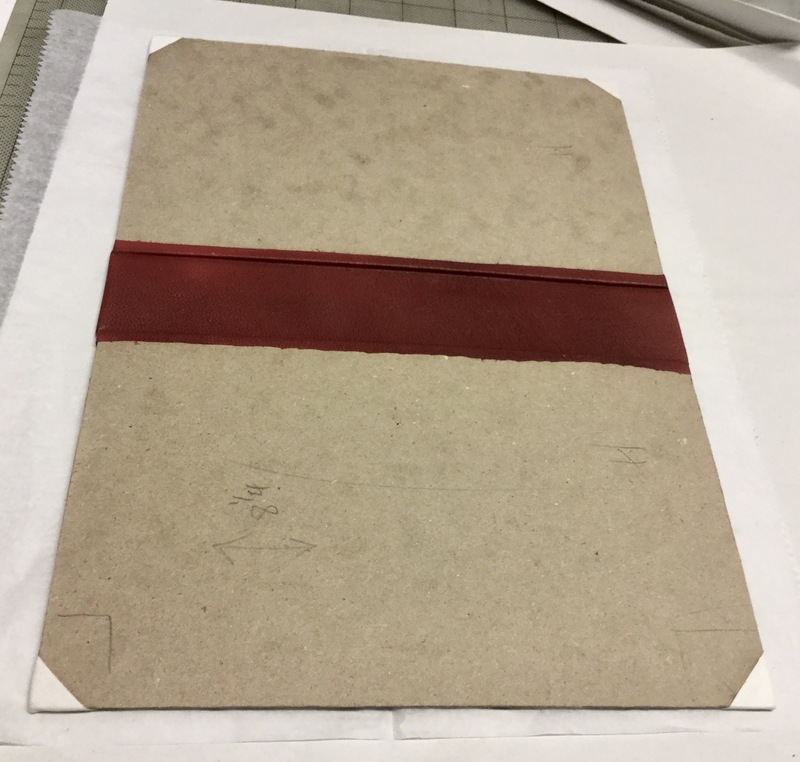 After a long day of reviewing instructions for things I don’t know how to do, I ended the work day with this: a Bradel case of a millimeter binding, with red leather spine and vellum tips. Needs to dry overnight. 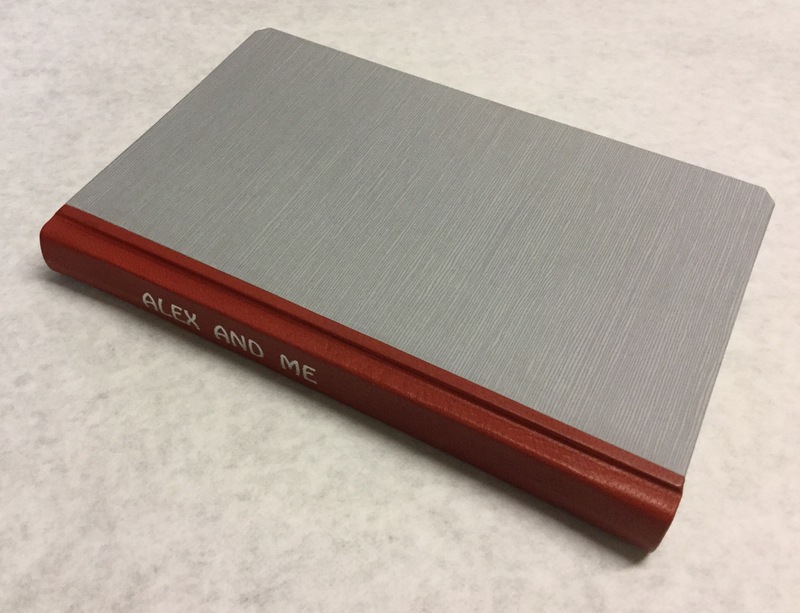 My current project is rebinding a copy of “Alex and Me”, by Dr. Irene Pepperberg. 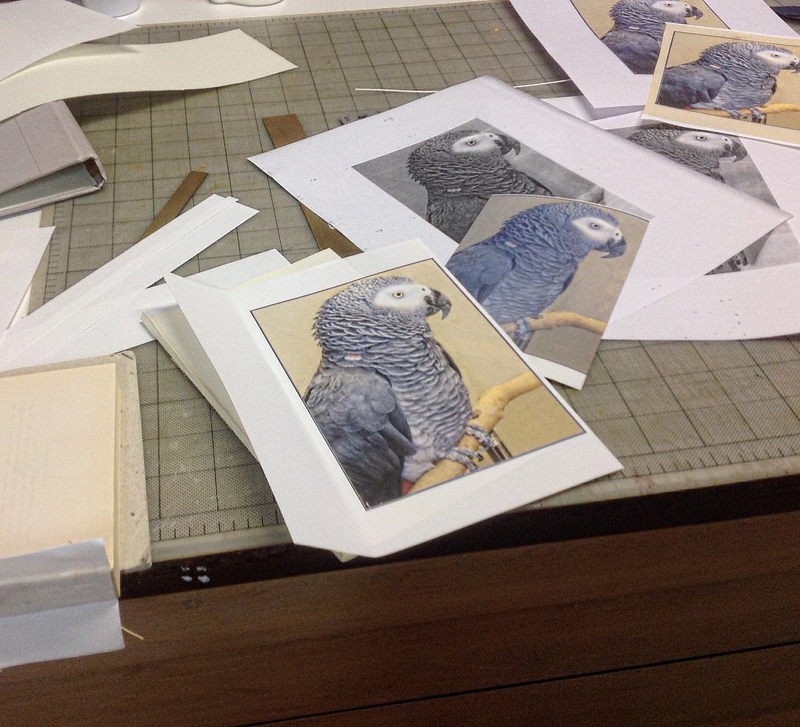 I’m amazed by the groundbreaking work she did with Alex, the famous African grey parrot. Alex could identify – in spoken English – more than 100 objects and say what color they were, what shape, how many, what material, and whether an object was bigger or smaller than another one. He even had a concept of “nothing” or “zero”. He was intelligent, with an outsize personality and a sense of humor. Dr. Pepperberg always referred to him as a colleague, and their achievements changed everything we know about animal cognition. Before Alex, scientists thought only a few primates were capable of human-like thought, and that birds were at best imitators and mimics. Alex performed at the level of a five year old human child on many tests. Sadly, Alex died in 2007. Dr. Pepperberg’s research is still ongoing, with two African greys named Griffin and Athena. Unbelievably at least to me is the fact that this research is entirely funded by The Alex Foundation, with no federal funding at all. What kind of world is this? Everybody who works in the field of animal intelligence gives credit to Alex for opening an entire realm of possibilities. Together, Alex and Dr. Pepperberg helped changed how we think about how animals think, and inspired a new generation of researchers to continue exploring this incredible new world. Here’s the work in progress. 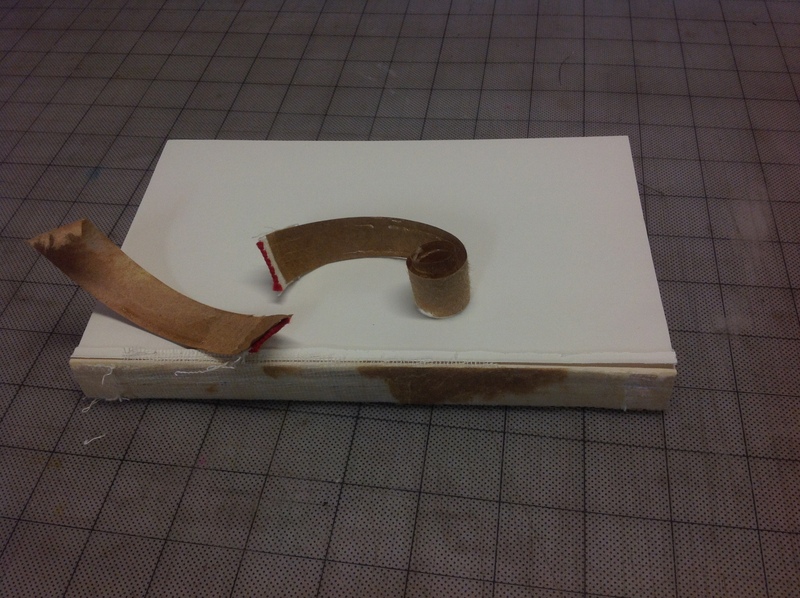 Remove dust jacket, cut cover off, remove stuck-on headbands and paper spine liner. 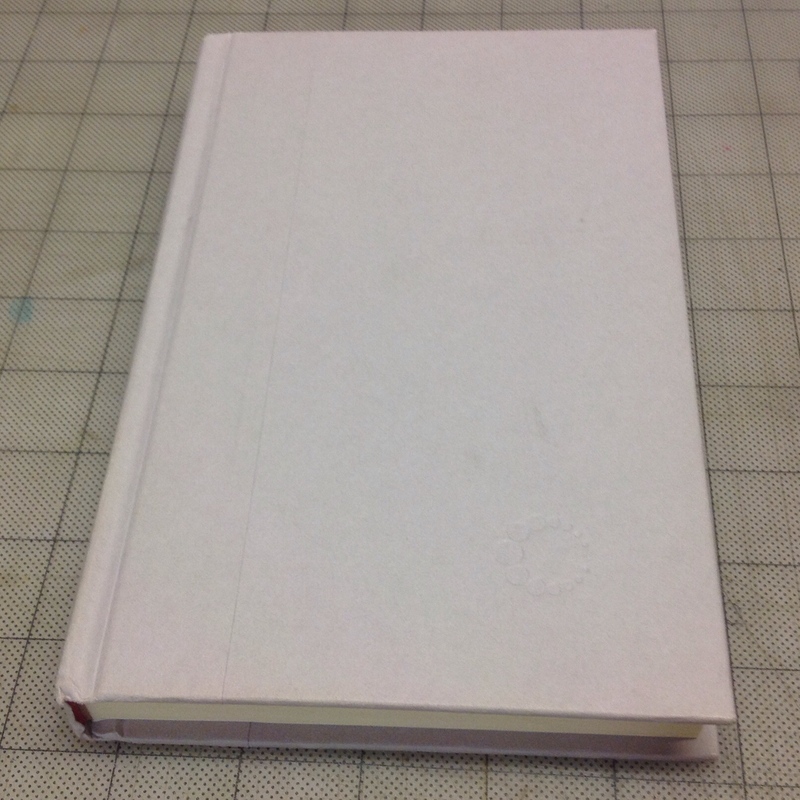 Removal of the cover revealed that this is not a sewn binding, but a perfect-bound (glued) book. I will have to recase it, using a few tricks to strengthen the binding. First, I cut several shallow grooves into the spine, inlaid thin linen cords, applied more EVA, and lined with cambric. While that was curing, I worked on the unpublished photo sent by Dr. Pepperberg to remove distracting elements and extend the right side of the image. I picked out a couple of quotes for the frontispiece, and printed the new pages on acid-free endpaper using archival inks. I chose heavy red paper for the pastedowns – to match the African grey tail feathers – and made up endsheetsets for front and back. 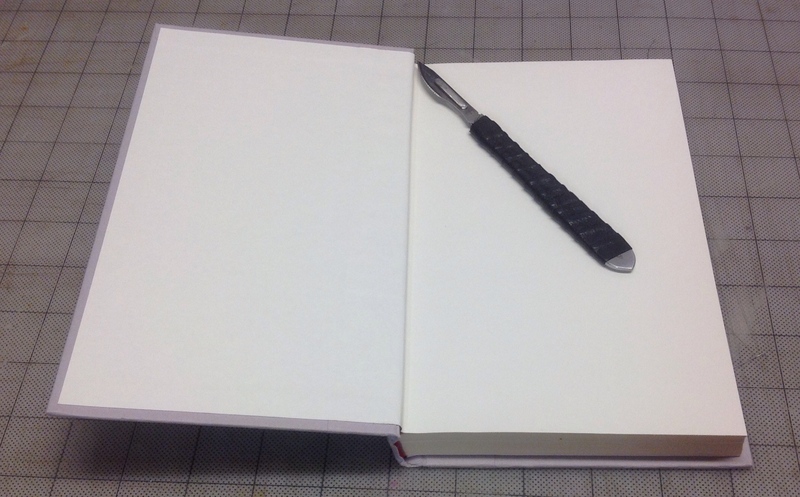 The new endsheets were sewn to the cambric spine lining, adhered with EVA, then hinged to the first and last pages of the textblock with Japanese paper guards. The cords laced through the spine were adhered to the outside of the pastedowns along with the cambric hinge. Then the text block was put in the press and the top colored to match the endsheets. I finally made a book for myself! The backlog in the bindery is so great that I haven’t felt able to take time for my own work. And that’s wrong. The whole reason I began bookbinding was because I loved beautiful leather bound books. Digression: the first sentence I learned in Chinese class was “I don’t buy books. Books are too expensive.” I do buy books – lots of books – but fine leather books ARE expensive. My masterful plan was to learn bookbinding as a second career, and as a sneaky way to fill my library with fine, fine books. Who knew it would take so much time to learn bookbinding, set up a business and be bookbinder / janitor / receptionist / accountant / website developer / marketer … Guess what I haven’t made time to do? This is a copy of Small Kingdoms by my dear friend Anastasia Hobbet. I’ve had the unbound signatures sitting on a shelf for years. A piece of metal door screen – found amidst the debris decorating the riverbanks after a big flood liberated some trailers from a campground upstream – was the inspiration for this binding. I pulled it from the flotsam, admired the old-school pattern of the heavy aluminum, and knew immediately that it belonged on this book. Small Kingdoms is a book about the myriad hidden worlds of Kuwait. I met Anastasia in Kuwait back in 1996, lucky lucky me … and there I glimpsed some of these small worlds myself. Women’s faces were hidden behind veils, behind walls, behind screens. Pierced screens allowed the women to look down into gatherings of men that they were not permitted to join. Atop the layers of physical screens were the invisible barriers of language and culture – I simply could not see into that world. In a restroom at the opulent Sultan Center grocery store, I washed my hands at one of the sinks and turned to see a handful of paper towels, held out to me by a woman covered from head to foot in black silk. Billowing black abaya … heavy silk head scarf … thin black silk over the nose and mouth. Only her eyes were exposed: dark eyes lined with black, thick black lashes. She held out the towels to me without a word, and I took them from her without taking my eyes from hers. I thanked her, dried my hands, and we stood there looking at one another. She didn’t say a word …. she kept standing there … she kept looking into my eyes. It was, and is, a complete mystery to me. While many Kuwaiti men spoke english, having attended school abroad, many women did not – they were not allowed such education – and I think she didn’t speak my language, and I didn’t speak much of hers. The Gulf War was still recent memory and many Kuwaitis were extravagantly grateful to the US for helping to deliver their nation out of Saddam’s grasp.Was this her way of saying thank you? Or was she simply taking advantage of a private moment to inspect one of the strange western women who ran about unveiled? Was she looking to see what my world was like? Was she trying to tell me something about hers? It was a brief glimpse, an opening of the veil, a rare and intimate connection. I felt both dumb and blind. Here was a person right in front of me, and I could see her perfectly, but I could not see her at all. I felt deeply connected to her, but I understood nothing she was telling me. I finally turned and left because I didn’t know what else to do, and the memory haunts me still. Why didn’t I try to talk? Why didn’t I look for someone to translate? Wave my hands around? Did she need something from me that I didn’t give? Kuwait was not a place that I could understand, and this moment showed me that it was not even a place that I could even truly see. Years later, standing in the mud of the Big Flood, holding up the twisted square of trailer door screen, that moment came back to me. I knew that I would somehow bind a copy of Small Kingdoms with this screen. I knew already that I wanted the book to reveal itself gradually from within obscuring layers, but I hadn’t had any vision of what that might be. When I saw the screen, I knew I could use it in the binding to give just a glimpse of the book within. 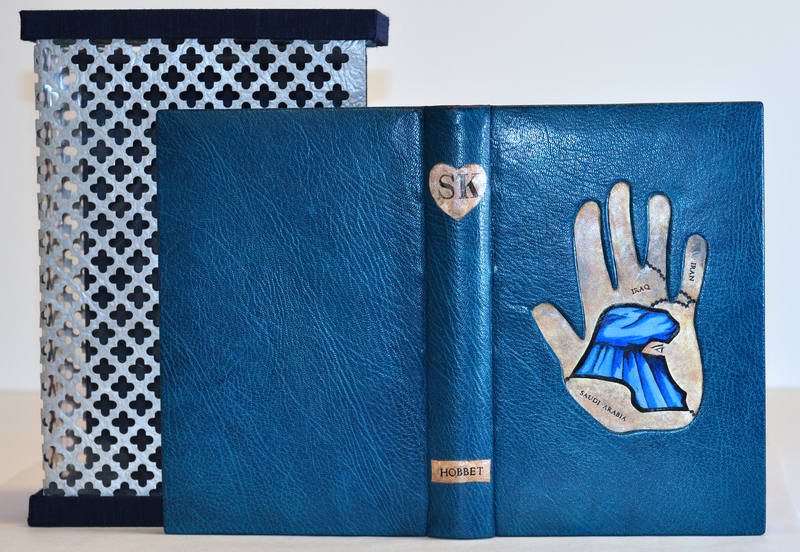 The binding is in teal Siegel goat leather, with an inlay of black and painted white leathers. The woman’s head contained within the outline of the map of Kuwait was inspired by the dust jacket from the commercially printed version. The map shows the scars and ash of war. The spine label is a heart, in honor of the deep affection between Anastasia and myself, and for the love that leads us to see other humans through the screens of culture and language. The hand shows that it is only – only – through some action of the hand, be it opening a door, reaching for another hand, holding out a paper towel, writing … that we make this affection manifest. It is traced from my own hand, because this is where I begin. The screen was a challenge. I didn’t want it to touch the book, so it’s lined inside with Mylar, and it’s hard to glue Mylar to metal. I used Loctite plastic glue, then sewed the layers together with linen bookbinding thread before encasing the edges in frames of Davey board covered in Asahi Japanese bookcloth. Within the outer shell is a close-fitting cradle that holds the book securely. An additional piece of board on the back helps support the book upright on the shelf. The whole thing is slightly imperfect: the screen doesn’t stay flat, the top and bottom of the case aren’t rigidly square… and I like it that way. I violated many habits in making this book. I violated my habit of needing everything to be perfect. I violated my habit of hoarding beautiful materials for more “worthy” projects. I violated my habit of guessing at what someone else would approve of. I violated my habit of doing things for others before doing something for myself. I made this book, I made it for me, I made it the way I wanted, I used my favorite colors and only put into it things I loved, including love. I hope other people think it’s beautiful too, and I hope that you all go buy a copy of Small Kingdoms to see the beauty that is the reason for the binding: the book itself.